Produced by: Last Generation Artists, Inc. The ambience was achieved from the natural acoustics of the sanctuary of Jan Hus Church. The Gothic style architecture combined with sold wood surfaces, including the arched ceiling enabled us to place the two microphones ten feet away and eighteen feet in the air, producing the maximum desirable directed to reflected signal ratio. 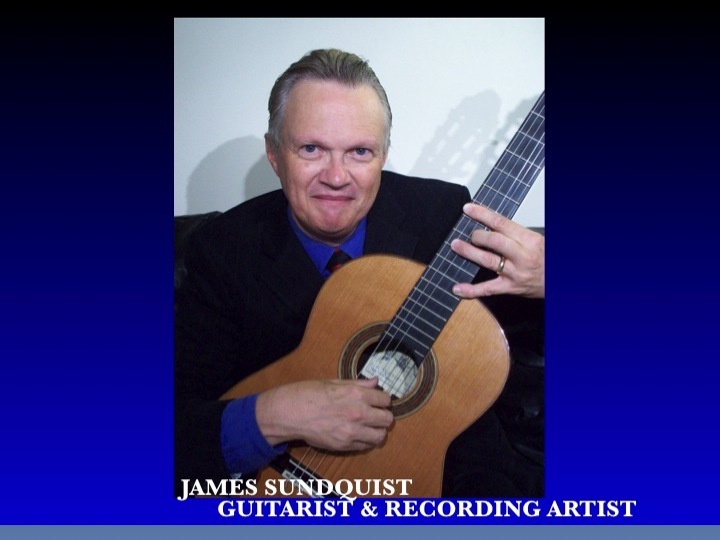 STEREO REVIEW: "Beautifully played by James Sundquist,with extremely informative notes." BILLBOARD MAGAZINE: "Sundquist performs these classic hymns...effectively in a way that moves the listener." 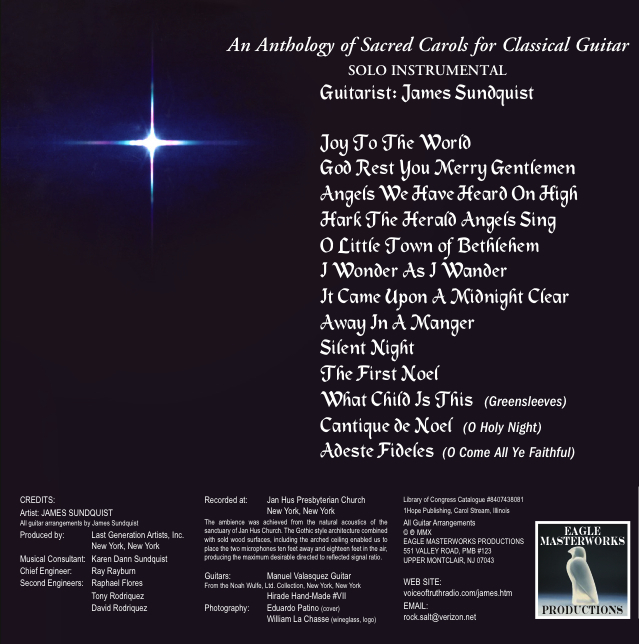 CHRISTIAN HERALD: "Startlingly beautiful, intense and worshipful collection of Christmas Carols...Sundquist displays excellent musicianship...his own arrangements float and dance through the melodies." CCM: "An unusual instrumental collection." traditional carols on this Grammy-nominated CD with a respectful, reverent tone." "My favorite piece is Cantique de Noel which Mr.
Sundquist performs with understated elegance. It was the most moving carol on the CD, to my ear, and even hinted at a rumor of a more popular style. To his credit, Mr. Sundquist's style (quite expressive for the classical genre) remained in check and in bounds without being entirely sublimated to the form. It is easy to see why National Public Radio has given Sacred Carols substantial airplay." Dr. Ted Baehr, President, MOVIEGUIDE, Nov/Dec 2009: "Timeless masterpiece of instrumental music...must listening...elegant, classical, refined, soothes, touches, and﻿ inspires the soul...will capture the heart and mind of anyone who listens to it...brilliant CD"
"5.0 out of 5 stars Very nicely done. A very good CD to cuddle up next to the fireplace with on a cold winter's night, along with a good book, a hot cup of cocoa or coffee, and the christmas tree twinkling. Sundquist's very tasteful and pensive renditions of these carols is very simple,sometimes haunting and melancholy, and always beautiful and relaxing. This is so refreshing when compared to some of the most recent redo's of old favorites by pop stars." January 11, 2006 By PJ "terriergal"